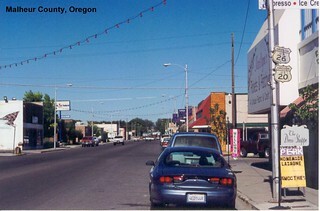 Information about the history of US 20 in Oregon can be found on ORoads. Some pictures and descriptions of old alignments of US 20 east of Bend, Oregon can be found here and here on the American Road forum. A 1958 photo of US 20 in Juntura is available in the Charles W. Cushman Photograph Collection. I took a photo from nearly the same spot 40 years later. Not much had changed aside from the bridge and road being widened slightly.